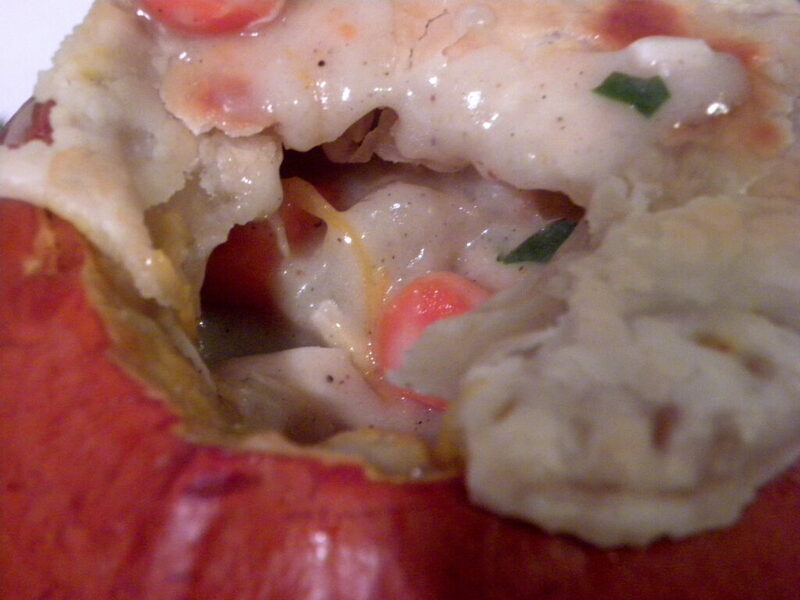 I finally made my super festive chicken potpie in pumpkin recipe that I learned from my class at Stonewall Kitchen. It was actually amazingly easy and I thought it came out really well. 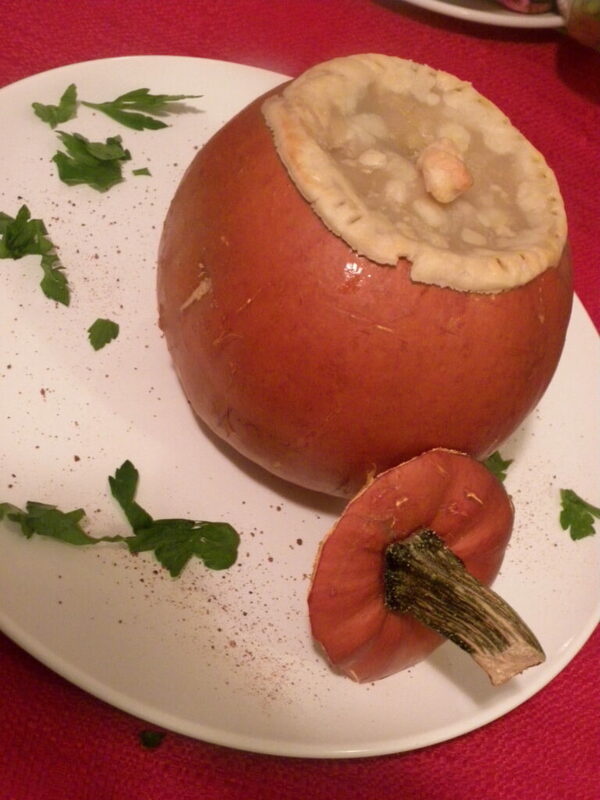 It’s perfect for Halloween, Thanksgiving, or just a nice Autumn meal. Whatever you make it for, just make it! The recipe was for 6 pumpkins. I only used 2, but they were a bit bigger than normal and I wanted some extra chicken potpie for leftovers, so I just followed the recipe given. It looks like a lot of ingredients, but don’t be intimidated; it’s really not! 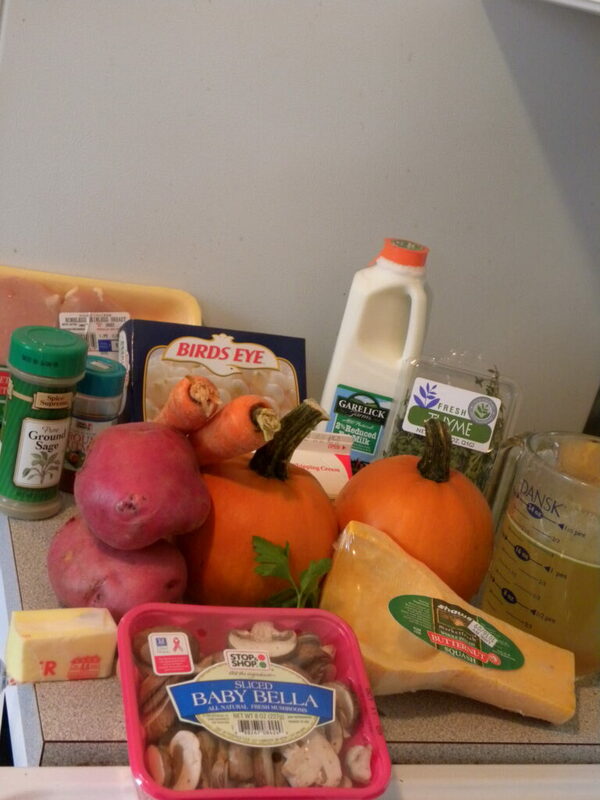 Just ignore that beautiful butternut squash in the photo. I had a grand idea of including squash in my potpie, but then quickly realized I had more than enough going on in the filling and squash was totally unnecessary. Also, add some pie crust into that photo! My biggest problem was cutting the tops off the pumpkins. The pumpkins were way too hard to cut into. I started to freak out a bit! 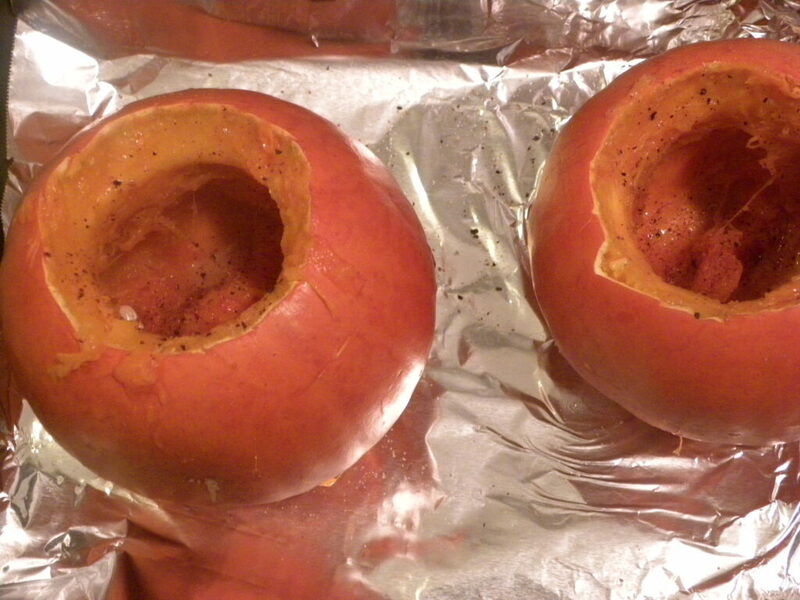 But then I figured I’d put the pumpkins in the oven for a little bit to soften them. It took about 20 minutes, but then I could finally cut into them. Phew! I just cut the tops off and scooped all the seeds and membrane out. You can obviously keep the seeds and toast them if you’d like. 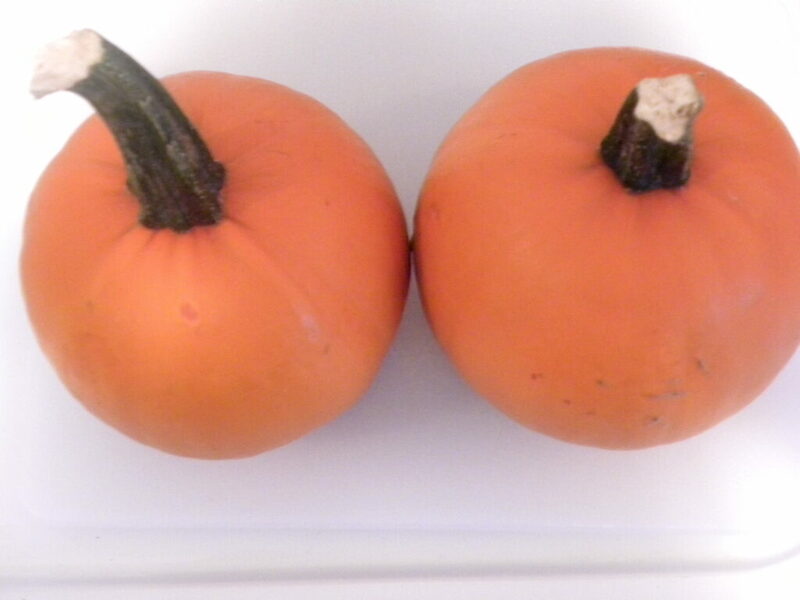 Once your pumpkins are cleaned up, brush the inside of them with 2 T of melted butter using a pasty brush. Then season with 1/2 t salt, 1/4 t pepper, and 1/4 t nutmeg. Wrap them in tinfoil and pop them in the oven at 375 degrees for about 30 minutes. Even though mine had already been in the oven for some time, I kept them in for another 30 minutes as I wanted them nice and tender. In the meantime, you’re ready to make your filling! 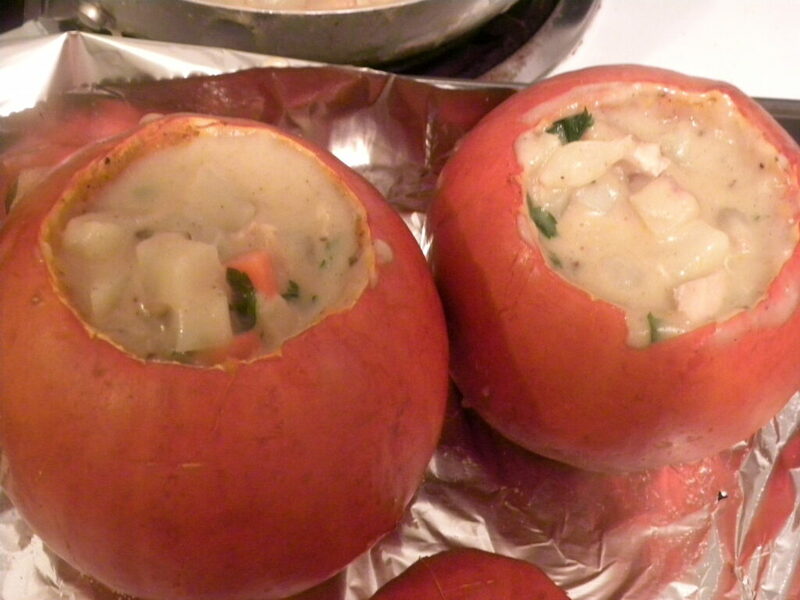 As you can see in the photo, I used frozen pearl onions, so I didn’t need to peel them or anything. I simply let them simmer in a pot of boiling water for a few minutes. Then I drained them and set aside. I got out my big skillet and melted 5 T of butter over medium heat. Then I added my chopped potatoes and cooked until the potatoes were getting golden. 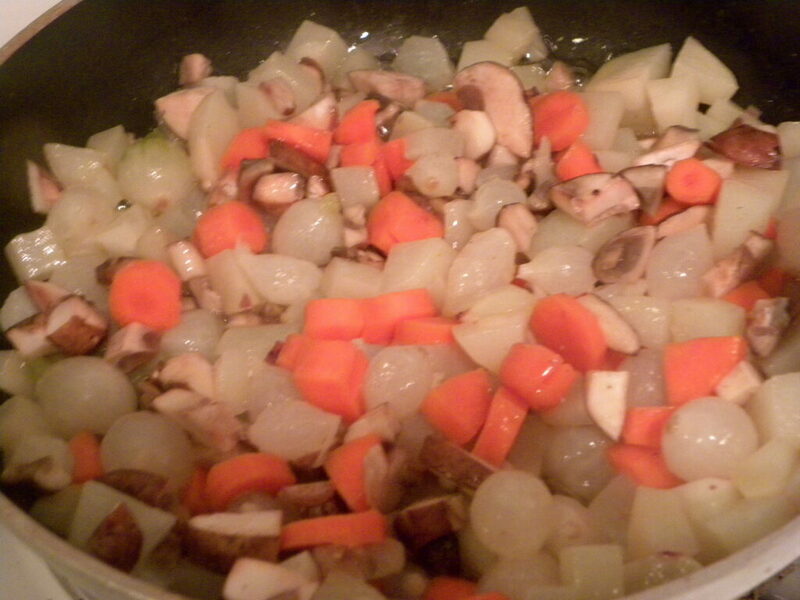 Then I added in the carrots, mushrooms, and onions and cooked for about 4-5 minutes more. Then the flour went in and I cooked while stirring the mixture for about 1 minute. I added my chicken stock and milk and brought it to a simmer. 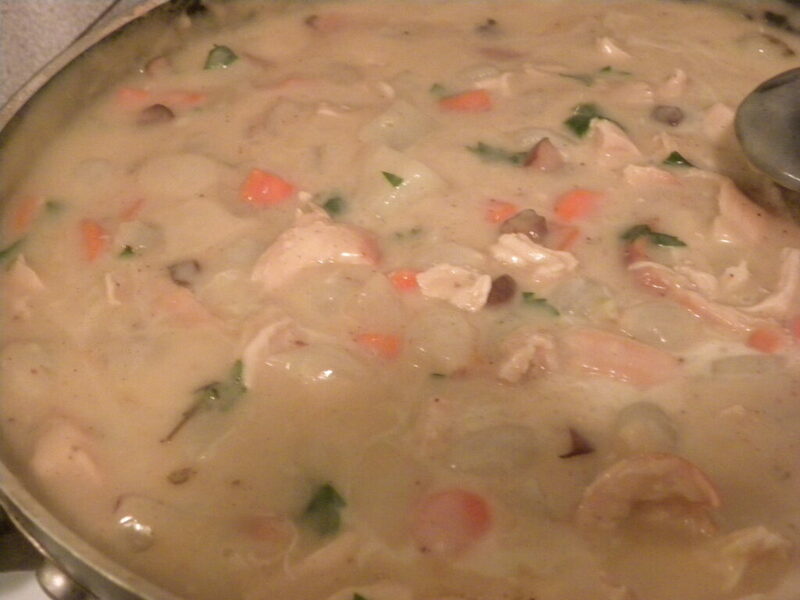 Then I realized that the recipe didn’t tell me what to do with that 1 T heavy cream listed in the ingredients, so I added it here as well and kept the mixture at a simmer. As I stirred it for about 2-3 minutes, it started getting nice and thick and bubbly. Then I added the chicken (I had cooked it in a frying pan earlier, let it cool, and tore it into little pieces), parsley, sage, thyme, 3/4 t nutmeg., 1.5 t salt, and 3/4 t pepper. Remove from heat and divide among the pumpkins. I filled mine up to the top and obviously had a lot leftover. Then cut little circles in the pie crust; I used a drinking glass to make mine. You can either make your own pie crust (I highly recommend this recipe) or use frozen. I usually choose to make my own for pies, etc. but for something this small, I say frozen is fine! 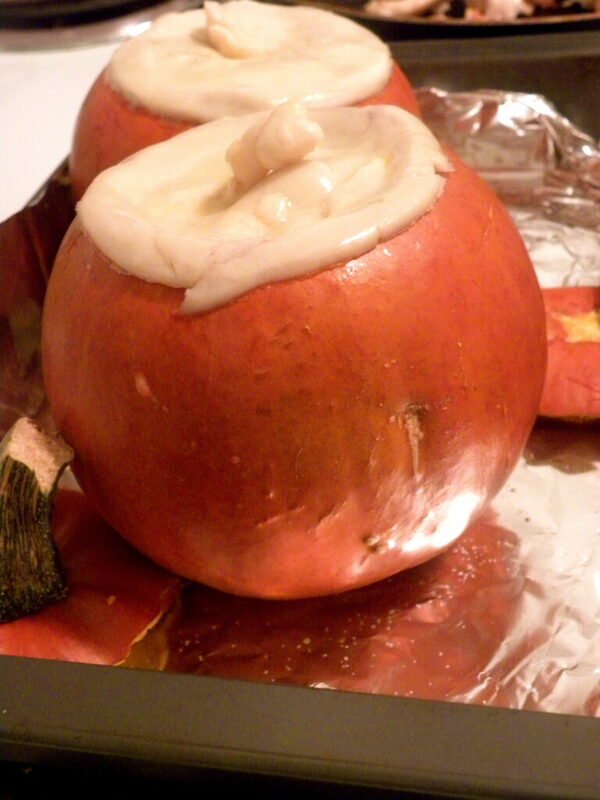 Place the dough over the pumpkin and pull the center of the dough upward to form a little stem. Cute! Use a fork to create little ridges along the edges of the dough. Crack your egg in a bowl, whisk it up and then brush the dough with it using a pastry brush. The pop the pumpkins back in the oven! The recipe said to bake another 45 minutes, but I just baked them until my crust was crispy and golden, which was a little less than 30 minutes. How adorable are these?? I would love to serve these at a little dinner party; one for everyone! And the inside was SO good. It was perfectly creamy and the veggies were cooked really well, but not overdone (I hate over-cooked veggies!). So, the next time you’re thinking about making a potpie, just buy a couple pumpkins and make your meal a bit more seasonal. Also, he fabulous thing about this recipe is that there are no rules. You can add whatever veggies you want in it and leave out whatever you don’t like. This has taken my pumpkin obsession to a whole new level! Now what else can I make a chicken potpie in? 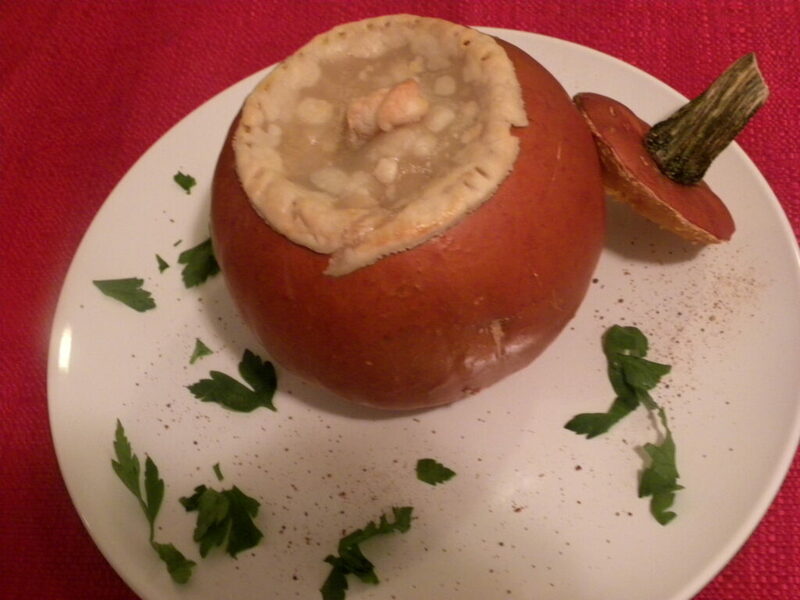 18 Responses to "Chicken Potpie in a Pumpkin"
Great recipe and awesome idea for a delicious Fall favorite. susie that looks amazing i can’t wait to try it! I am a huge fan of your blog! I check it all the time, and I have to admit that I’ve been checking it even more often since I read your post about the Stonewall Cooking Class and the Chicken Pot Pie in Pumpkins, waiting for you to give it a try! I can’t wait to give this recipe a shot! Both you and Chels are helping my cooking tremendously! Keep it up and thanks for the recipes! Found your blog through Foodbuzz, and I read the ‘about’ and thought it was such a great idea! What a great idea! I love how darling the pumpkin looks with the dough topper and stem! I love these!!! 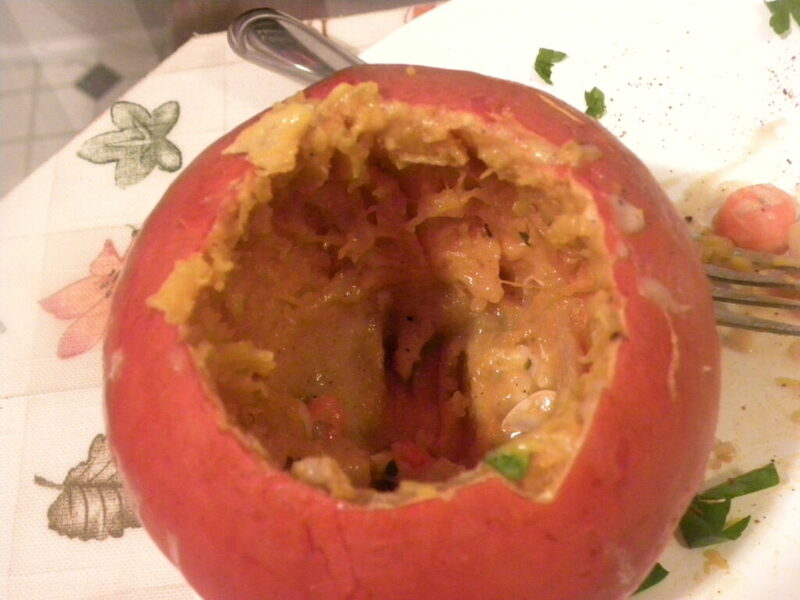 Food in a pumpkin is far cuter and apparently more delicious too. 🙂 Great idea for some hearty fall fare. How cute and appetizing! Great idea! What a cool idea, these look delicious! This is such a fantastic fall dinner! I LOVE this. I’m not sure if my kids would think that this is cool or if it would freak them out that they’re eating out of pumpkins. I’m going to give this some serious thought! So cute!! You have caused a mild sensation in our office with this one. Two separate people IMed it to me. And now I’m hungry for puff pastry and pumpkin and creamy chickeny goodness and trying to figure out if I can make that happen tonight. I make these every year! All of my friends and family ask for them. I have even made them and taken them to the local pumpkin patch for display, at their request. Thank you for sharing your experience.